18 November 2010, at 8:29a.m. 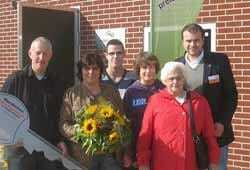 GERMANY - Three internal Open Days in North Western Germany recently caused great interest in the region and beyond. 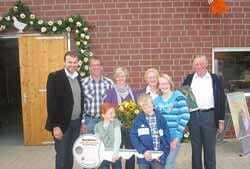 Within only one week, four new houses with approximately 130,000 places for laying hens have been handed over to the families Köllen (district of Emsland), Röben and Veldmann (both county district of Bentheim). More than 500 guests accepted the invitations to get to know NATURA-Step and NATURA-Nova, two aviary systems from Big Dutchman for floor and free-range management of laying hens. For more information on layer management in Big Dutchman aviaries, click here. Big Dutchman sales representative, Christian Apeler, congratulating the Köllen family on the occasion of the inauguration of the new houses. On a beautiful sunny day the entire Röben family was looking forward to welcoming the guests on their Open Day – of course also the company Big Dutchman congratulated on the occasion of the house inauguration. 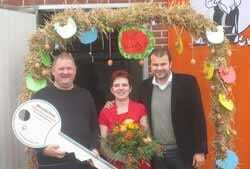 Hendrik and Nicole Veldmann are happy about the bunch of flowers as well as the decorative key.